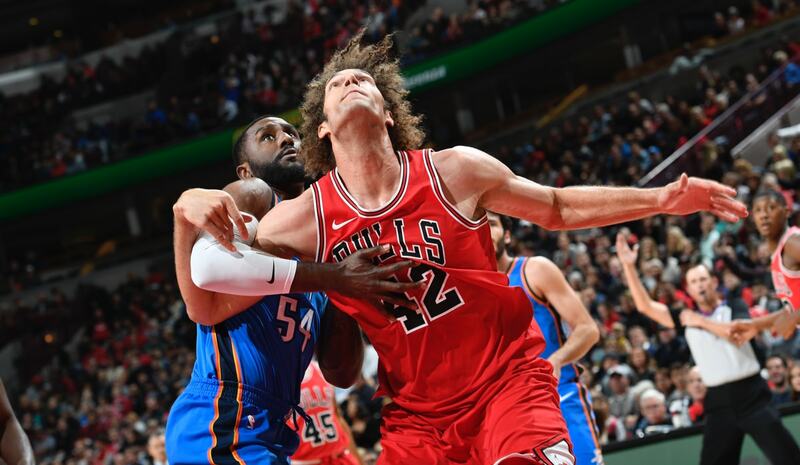 The Bulls Saturday were finished—not enough Finnish this time, however—early in a 101-69 loss to the Oklahoma City Thunder. But at least they finally got a chance with being Dunn. It wasn't necessarily well Dunn, but perhaps that will come. 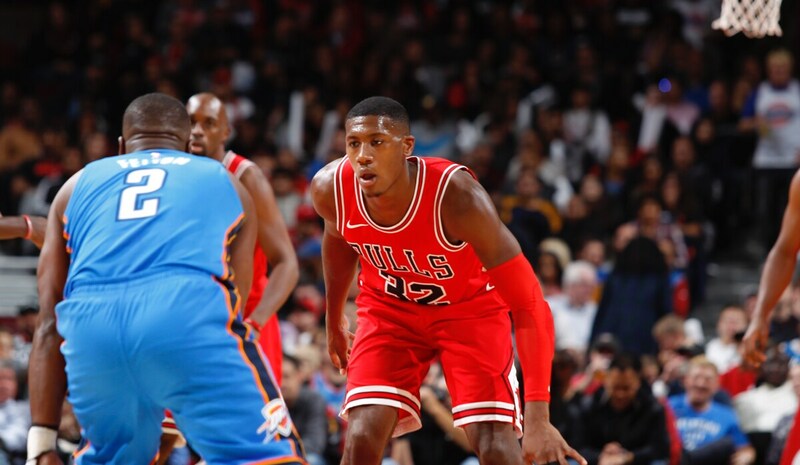 "I knew I would be a little rusty," said Kris Dunn, who made his Bulls regular season debut. "I didn't get too many practices in before this game, so I thought I would go out and play a little rusty. But what will help me is playing hard, getting guys the ball and having fun with it; I was happy to be out there. I can play better, but the good thing is I went out and played for my team and fought through it; first half I had a bad half, but I fought through and tried to play for my guys. "Like we say here, I (want) to get my swagger back, like I played in college, play with that confidence, that grit. I'm going to get it back," Dunn promised. "Just takes a lot of hard work, a lot of film session and just improving." The same might be said for the Bulls, who in falling to 1-4 played their least competitive game of the season, falling behind by a dozen three minutes into the game, getting back within 26-23 after one quarter and then trailing by double digits the last 32 minutes and by more than 20 points the last quarter and a half. 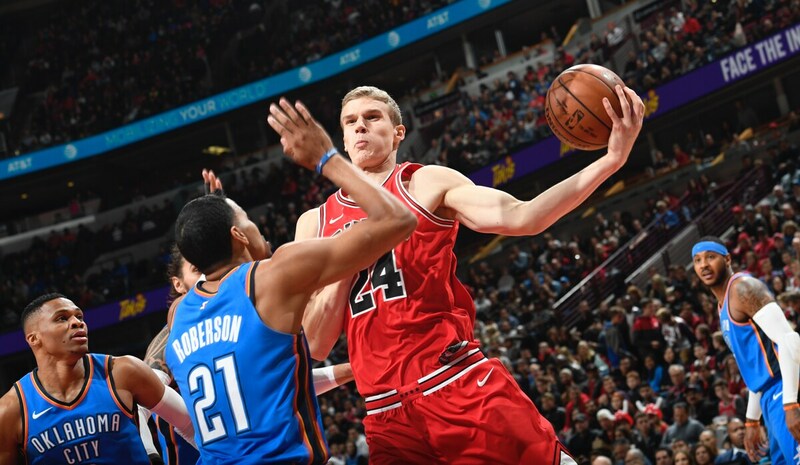 The Bulls were led by Lauri Markkanen with 15 points and eight rebounds, though teammates pretty much ignored him and he attempted just seven shots. Justin Holiday had 11 points, Robin Lopez 10 and Dunn eight points, four rebounds, three assists, three steals and five fouls in 22 minutes. The Thunder, whose starters basically sat out the fourth quarter as none scored after three, were led by Carmelo Anthony with 21 points and Paul George with 20. Russell Westbrook had a triple double with 12 points, 13 rebounds and 13 assists. The Bulls were the only opponent against whom Westbrook never had recorded a triple double. The Bulls shot a poor 28.2 percent overall and 10 of 37 on threes and committed 20 turnovers, eight in the second quarter when they were outscored 24-8. "We didn't compete at the same level we were competing the other games and the other days"
That produced an unusually annoyed Bulls coach Fred Hoiberg after the game as he called out his team for surrendering. "I thought we took a huge step in the wrong direction tonight," Hoiberg said. "We didn't compete. We didn't stay together. We didn't fight through adversity. As a team, we were careless. We were stagnant. They got the loose balls. That cannot happen with this group. It's very disappointing coming off the encouraging win against Atlanta by doing all the little things, by winning the 50/50 balls, by dominating the glass. We had none of that tonight. Our body language sucked. Things weren't going well. We just dropped our heads and kind of gave in. You can't do that as a young team. We'll regroup. We'll get back and have our hardest practice of the year on Monday and try to get back on track." Though not much record-wise is expected this season of this young team fighting early injuries, the promise was relentless, spirited, unselfish play. That had mostly been extant the first four games. It wasn't against the high powered Thunder, against whom the Bulls players appeared overwhelmed and intimidated, seeming to fear reputations. It led to one of those come-to-Robin post game sessions. "It falls on my shoulders, Justin's shoulders, Quincy's (Pondexter) shoulders," said Lopez. "We have to get everyone going. It comes down to we didn't have that edge tonight that we need every night. Justin talked, I talked, Quincy talked. We all know what happened. We have to toss this away and get back to work." Hoiberg promised, in effect, another open competition in the Monday and Tuesday practices before road games in Miami and Orlando later this week. It was another tough game for starting point guard Jerian Grant, now one of 16 on the season shooting threes as he tries to morph into the unfamiliar position of point guard. Grant led the Bulls in assists, as he has every game, with four. But even as Markkanen, the team's best shooter, had two first quarter shots, both made threes, there seemed little attempt to find him, or a recognition of where he was. "We missed (Lauri) on several occasions," agreed Hoiberg. "He was standing out there by himself and we took extra dribbles and tried to get through small spaces and turned the ball over; when Lauri has it going like that, we have to make a point to get him shots." Holiday shot four for 16 and Denzel Valentine off the bench shot three for 12. Valentine and Grant are now shooting 33 percent overall on the season. Paul Zipser returned after missing one game with knee soreness and was a non factor again with three points and one of five shooting. He is shooting 37 percent overall. Markkanen, who is shooting 42 percent on threes, was three of seven overall and three of six on threes. And he wasn't getting that much defensive attention from the Thunder. They were being physical with the Bulls, dunking on them on Westbrook to Steven Adams rolls and bumping the ball away. The Bulls seemed to accept the inevitable fate. "We didn't compete at the same level we were competing the other games and the other days," observed Markkanen. "So we're disappointed in ourselves. It's not just about the blowout win for them, but how we didn't compete and how we lost and we have to get that back." So it was left to examine the debut of Dunn, who suffered a dislocation the third preseason game and just began practicing with the team. Dunn is one of the three players acquired in the Jimmy Butler trade, and in some respects the most important because of his position at point guard and the uncertainty after a poor rookie year in Minnesota. Zach LaVine has proven himself as a top scorer and athlete and is recovering from knee surgery and perhaps due back in December. Markkanen has made a quick mark on the team and the game as one of the league's most productive rookies the first two weeks. If Dunn can emerge, no matter how well Butler does, the trade will be a plus for the Bulls. Dunn entered the game with 3:30 left in the first quarter and the Bulls trailing 22-16. He had a tough start with a spinning shot for an air ball, three quick fouls, a turnover and two more missed drives. He was zero for three with three fouls in the first half in just over eight minutes. "We anticipated a little bit of rust," said Dunn. Dunn came back in for Grant midway through the third quarter with the Bulls trailing 63-38. George was twirling Bulls defenders around with crossover and spin moves, Westbrook was getting to the basket so easily he was settling for layups. Anthony was just open. "I did let them have it at halftime," said Hoiberg. "We came out and cut the thing to 14 right away and then they went on a run and we folded again. It's the adversity we have been talking about from Day 1. We have to find a way to battle through and we did not do that." Dunn was much more settled in his second sequence. He squared up for a nice 23 footer, got two steals to add to his one in the first half, made four of six shots overall and tied for the team lead in assists in the second half. Which, unfortunately, was just two since you cannot get many assists with all those misses. Dunn showed good court vision with cross court passing. He penetrated some, though didn't finish strong and was careless with the ball at times with four turnovers in those 22 minutes. His shot when he's patient appears credible, but his dribble can be loose. He is quick. Dunn said he aggravated his dislocated finger late in the game, but it was not serious and he will not miss any time. Will he be the starter the next time the Bulls play? "We're getting after it these next few days before we travel to Florida for these next two games," promised Hoiberg. "It's open right now. We're going to go in and compete and see who wants to play."